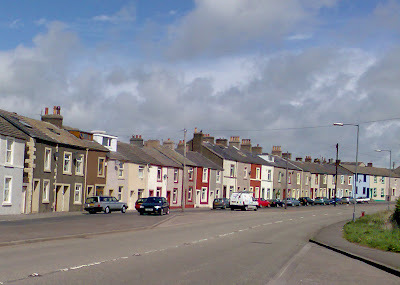 This colourful row of houses is located in Cleator, close to the train viaduct across the Keekle River at Cleator. The River Keekle is a river running through the English county of Cumbria. The source of the Keekle is to be found at Keekle Head Farm on High Park between Gilgarran and Asby. From there, the river moves gradually southwards via former open cast mine between Frizington and Whitehaven to Cleator, where it becomes subsumed by the River Ehen. The river is noted for its occasional abundance of salmon.